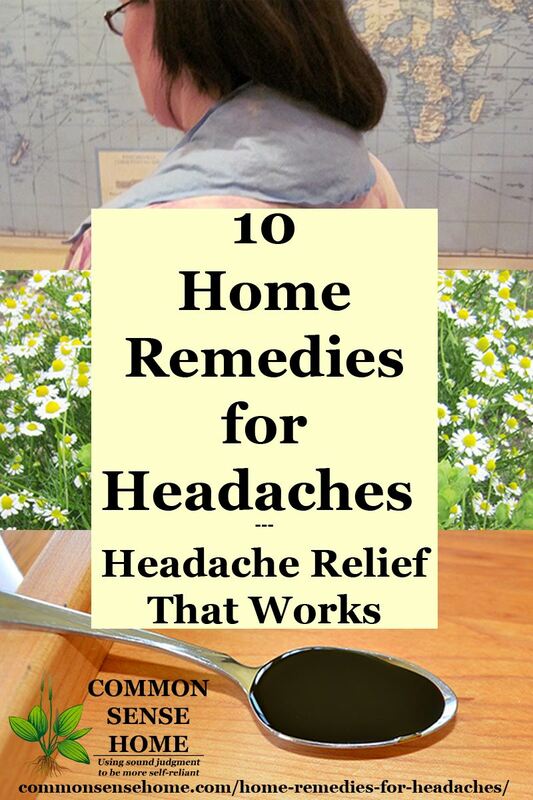 These home remedies for headaches give you a range of options for headache relief, and many of them are free or low cost. Note: If you're dealing with constant headaches, diet and lifestyle changes may be needed. Pain is our body's way of getting our attention. If you have chronic or severe headache pain, please see a healthcare professional. Only your health care provider, personal physician, or pharmacist can provide you with advice on what is safe and effective for your unique needs or diagnose your particular medical history. Material on this site is for general informational purposes only, and is not intended to take the place of a healthcare professional. Be careful out there, folks! A primary headache is caused by dysfunction or overactivity of pain-sensitive features in your head. A primary headache isn't a symptom of an underlying disease. Chemical activity in your brain, the nerves or blood vessels of your head outside your skull, or muscles of your head and neck — or some combination of these factors — may play a role in primary headaches. Some people may carry genes that make them more likely to develop such headaches. Secondary headaches are a symptom of a disease that causes pain in the head. Dr. Alan Mandell notes that roughly 90% of headaches are tension headaches (more on this below). Migraines may require special care. For more information, see Migraine Relief Tips and Treatment from a Long Term Migraine Sufferer. 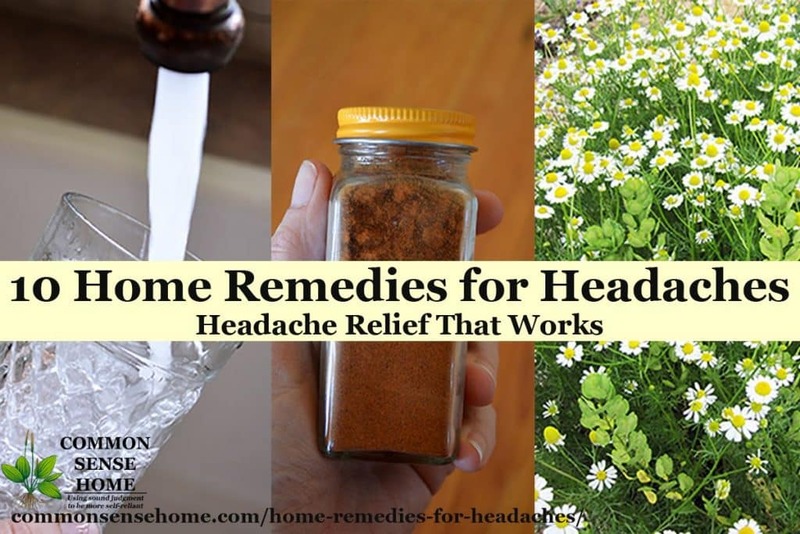 The following headache remedies are based on the book Home Remedies: What Works, Earth Clinic – Headache Remedies, personal experience or as noted. Simple dehydration is a common cause of headaches (and muscle aches). Make sure to drink plenty of non-caffeinated beverages over the course of the day. Skip the soda, especially diet, as no-cal sweeteners are a headache trigger for many. Excess sugar ties up magnesium in the body. Low magnesium is another potential headache trigger, so soda or plain juice may hurt more than they help. Plain water or infused water, water kefir, coconut water and herbal tea are all great options. Ice constricts blood vessels, which may reduce pain and inflammation. Try applying an icepack on your forehead or at the base of the skull at the first sign of a headache. Alternatively, if you can tell that your muscles are very tense, try heat. Place a hot pack or heating pad on tight neck muscles, or soak in a warm bath. I've tried both, depending on the type of headache. Core Products is a Wisconsin based company that creates a wide variety of fabric based products, including hot and cold packs. I learned about them through one of my closest friends, who is one of their product designers. She gifted me with a hot and cold pack many years ago, and I liked it so much I've purchased several more over the years. These packs have frost free covers and are filled with non-toxic, biodegradable gel. I keep some small ones in the freezer and I use larger ones with heat. For headache relief, I recommend the 6″x10″ CorPak Soft Comfort Frost-Free Hot/Cold Pack for an ice pack. For heat, go with the larger 6” x 20”Cervical Soft Comfort Hot and Cold Pack. This size is shaped to drape over the shoulders. Find a cool, dark, quiet room and take a 10-15 minute nap. This tends to work better for migraines and tension headaches, but can make cluster headaches (those with stabbing pain around the eyes) worse. Note that too much sleep or a significant disruption in your sleep schedule can trigger headaches. Sometimes I even put a pillow over my head (just leaving an air hole) to block out light and noise. If you have a noisy bedroom with too much light, consider a sleep mask with ear plugs. This is a great option for tension headache relief, as physical activity helps to relieve muscle tension. Your muscles want to stay doing whatever they're doing, which can lead to them knotting up and shutting you down. Get up, take a walk, swing your arms and get that blood flowing and those muscles relaxing. Your chiropractor will be happy you did (even though you may visit them less often). Massage is a great DIY headache treatment that you can use almost anywhere. The quick video below demonstrates a simple massage technique for tension headache relief. Rubbing the temples in a circular motion or firmly massaging the neck and shoulders to relieve tension may also be helpful. Low levels of magnesium in the blood are commonly associated with headaches, especially in women, particularly migraines and headaches related to the menstrual cycle. 400 – 700 mg of magnesium daily is considered safe. Excess magnesium taken orally can put a strain on the kidneys, so don't overdose. Some forms of magnesium absorb better than others, so look for magnesium supplements chelated with glysine or lysine for best absorption, like Doctor's Best High Absorption Magnesium Dietary Supplement. Magnesium citrate oral magnesium is used as a laxative. Apple cider vinegar comes to the rescue again as the most popular recommended headache treatment on Earth Clinic. Contributors recommend anywhere from a spoonful to a quarter cup of ACV – straight up or mixed with water – however you can get it in. #2 at Earth Clinic for home remedies for headaches, this appears to be a remedy for the brave. Headache relief via cayenne pepper is a favorite of people who have cluster headaches. To use cayenne, inhale a very small amount up the nose, place some on the tip of the tongue, or mix it with water and drink. I'm personally afraid of this one, but it works for some. When brewing tea for medicinal use, a longer brewing time is typical (10-15 minutes). During this time, cover your cup with a small plate or lid to trap volatile compounds. Frankincense and propriety blends are also commonly recommended, but frankincense is becoming critically overharvested, so it's not a good first choice where other oils will do. The simplest and safest way to use essential oils is aromatherapy. Try inhaling a bit from an open bottle, or place 1-3 drops of oil on a tissue or hankie and inhale. I like tucking a hankie into a chest shirt pocket. This keeps the oil in range, but not too close, and keeps my hands free. Also, if you find a particular oil is making your symptoms worse instead of better (everyone is different), a tissue is easily tossed. Whole room treatments take much longer to dissipate. Don't forget to check out the rest of our Home Remedies Series for help with other ailments such as coughs, congestion, and upset stomach. I just bought doTerra’s Past Tense, tension blend, it’s in a roll on bottle. But since buying it I haven’t needed to use it! That’s probably because I cut out soda… 🙁 I miss it, but I feel so much better! I have some of that, and it does help, too. It smells nice as well. I read somewhere that pineapple or pineapple juice will stop a headache…I happened to have one when I read that, so I ate a chunk of pineapple and the headache went right away! I later bought some of those small cans of pineapple juice and they seem to work good too! I’ve never heard of that one, but bromelain, is found in pineapple, and is a natural anti-inflammatory. I have suffered from migraines my whole life. I had been on the highest dose of inderal for years but when I became pregnant with my youngest I couldn’t take my medicine anymore. My midwife recommended I start taking B-2 400 mg a day. I had my doubts but oh my gosh!! Miracle! It is even on the migraine website. I have to say from someone that never trusted homeopathic remedies because of my long history of them not working, I was proved wrong. I’m so glad you found something that worked for you, and thanks for sharing your experience. neither is magnesium, but it is mentioned as one above and if B vitamins work as the essentials in vitamins are often not consumed enough in our daily intake and yet are a natural substance in foods and plants, if it works that is awesome. When i have a headache i go and brush my teeth for a bit longer then usual. Kind of like meditation. And it really works for me. B-2 is not a homeopathic remedy. It is a vitamin. Dehydration would probably be the first thing I would check, since it is the easiest to address. Next – do you consume artificial sweeteners, of large amounts of sweetener beverages. Artificial sweeteners are excitotoxins, and damage your brain. Sugars tie up magnesium in your system, and low magnesium levels are also linked to headaches. You’ve got a trigger in your life if this condition is chronic, so you need to look for the trigger while addressing the symptoms. I have had migraines all my life and I get severe sinus headaches from my allergies i usually vomit with those the only thing that works is 2 extra strength excedrin no light no sound and sleep. I am pretty good at predicting a storm coming, as I usually get weather change related headaches. 1/2 of the lowest dose of Atenolol (25 MG tablet – split) takes it away even before the storm hits. I keep it with me so I can take it when I need it ASAP. It is a blood pressure med with this off use. Nothing else seemed to work for me. I bless the Dr. who suggested I try it.